Each card game has its own unique and ancient history. The most popular card game Blackjack dates back to the 17-th century. Although there are many disagreements between scholars about the origin and motherland of this game we'll try to describe the most famous historical facts. The dealer only could double. Players had to bet after every new round. The main aim of the game was to get 21.the English term "blackjack" originated from a special peculiarity of French ancestor - a payment for the card combination of Jack and Ace of Spades. After the French Revolution popular game migrated to America. 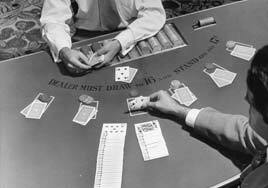 Card games were not prohibited at that time in the USA, so blackjack gained quickly its popularity. Professional gamblers understood very soon the potential of the game and created blackjack basic strategy for the perfection of their game. In the 19-th century blackjack was prohibited in America. But it continued its development and growth and became even popular than earlier. In 1913 gambling was legalized in Nevada and casino capital Las Vegas was born. 1953 - The very first statistic theory was used by Roger Baldwin in gambling and his theory was published in "Optimum Strategy in Blackjack". 1962 - E. Thorp's book "Beat the Dealer" was published, where he described calculating system of cards. 1970-s - Ken Uston gains great popularity in playing world and inspires millions of people in his book "Million Dollar Blackjack". With his colleagues he used a computer inserted in the shoe for counting cards. 1980 - Book "How to Play Winning Blackjack" by Julian Braun was published. This gambler studied blackjack game with a simulator. Nowadays blackjack is a very popular game in the whole world. You can play blackjack online or visit casinos, play classic variant or try yourself in something new.